Coach Umme Salim-Beasley watches during a recent practice in McGonigle Hall. Caroline O’Brien produced a dance performance focusing on the loneliness surrounding homelessness. going “toIt’sfeelreally like this enclosing feeling of loneliness for the dancers and the other artists. Local legislators explain why the state is still trying to end the longest budget impasse in its history. Kevin Dougherty dons his robes after being inducted into Pennsylvania’s Supreme Court at the Constitution Center Jan. 5. Hundreds of spectators gathered to watch the ceremony, including Mayor Jim Kenney. Students to use Main Campus as DNC housing DNC interns will stay at Morgan Hall in July. By JONATHAN GILBERT The Temple News Temple will serve as a hub for more than 200 students interns who will work at the Democratic National Convention later this year. From July 25-28, those who will work at the convention will be housed in Morgan Hall, said Michelle Atherton, the associate director of Temple’s Institute for Public Affairs. Atherton said the Washington Center for Internships and Academic Seminars chose Temple to house the interns. With many of the convention events occurring at the Convention Center and Wells Fargo Center, the interns will be able to travel on SEPTA’s Broad Street Subway Line. Interns will take classes, attend seminars and informational discussions with experts in politics and work with the party in the afternoon. More than 200 student interns will work at events at the Convention Center in July. was lucky enough to get accepted will have a wonderful experience that will certainly be rewarding,” he said. arts in the current academic climate, and this dean needs to be able to connect students’ majors to careers. (LEFT): Construction crews completed building Temple Stadium in eight months. (RIGHT): The stadium during a football game in 1929. The Owls finished 6-3-1 that season. Consider community It’s safe to say Jim Ken- with its surrounding neighney has been busy since he borhoods, and that he would was elected as mayor of like to see them address Philadelphia some of New Mayor Jim Kenney in early Nothose is right to consider the vember. longSo far community in stadium talks. standing in 2016, he’s issues had to address a Philadelphia before he would reconsider Police officer being shot by his position on the project,” a man pledging allegiance Hitt told the Inquirer. to the Islamic state and conWe’ve urged the unitroversial happenings at the versity to make a considerMummers Parade involving ate decision, so it’s nice to racial and anti-transgender hear the same from the 99th protests. mayor of this city. Last month, he also Talks about an onvoiced his opinions about campus stadium have been one of the most important ongoing, and we commend news stories involving Tem- university trustees and offiple: whether the Board of cials for not rushing such an Trustees should approve the important decision. construction of a 35,000-seat “We all take our roles stadium on Main Campus. very seriously and take a lot Kenney told multiple of time to look at this stuff,” news outlets he wants uni- trustee Joseph W. “Chip” versity officials to discuss Marshall III told The Temple stadium plans with the sur- News in late October. “We rounding community. His sweat the details.” spokeswoman, Lauren Hitt, We ask, however, that told the Inquirer in Decem- President Theobald—who ber Kenney had a produc- has stated multiple times he tive meeting with university supports a stadium—and officials about the possible other officials heed the adstadium. vice of Kenney, and continu“He told the representa- ously reach out to the North tives at the conclusion of the Philadelphia community meeting that he had concerns before choosing whether to about Temple’s relationship build a stadium on campus. A tough transition As shown in our news dean who can gracefully arsection this week, the search ticulate and emphasize how for a dean to oversee the liberal arts education can College of help a caThe new CLA dean will Liberal Arts reer with is still under- take on a large reponsibilty tuition risway. Head- in the second largest school. ing and a hunting firm national Isaacson, Miller will present media narrative that says a a group of candidates to ad- liberal arts education may ministrators. A final decision not be “worth it.” is expected by the end of this “We need to shape the semester. role of liberal arts in the curWe’re a bunch of stu- rent academic climate, and dents from the School of this dean needs to be able Media and Communication to connect students’ majors speculating about what we to careers,” said Jodi Levine want to see in a dean for an- Laufgraben, the vice provost other school, and the irony for academic affairs. isn’t lost on us, but we wantStudents are here pried to weigh in on what we’d marily to learn, but there’s expect. depth in the college experiPerhaps most impor- ence when the academic oftantly, this dean will take ficials running the show are the reins at one of the larg- accessible. Fox Dean Moshe est schools in Temple as the Porat does Twitter Q&As, union for full-time faculty SMC Dean David Boardman swells with the inclusion is just a tweet away and sevof adjunct instructors in its eral other deans have been ranks. It’ll take iron resolve frequent sources for The and a knack for negotiation Temple News. We hope the to direct the departments as chosen candidate is willing they deal with the change. and ready to hear from us For our fellow students and the rest of the student in CLA, we’d also hope for a body. The Temple News strives to be a newspaper of record by printing factually correct and balanced articles. Accuracy is our business, so when a mistake is made, we’ll correct it as soon as possible. 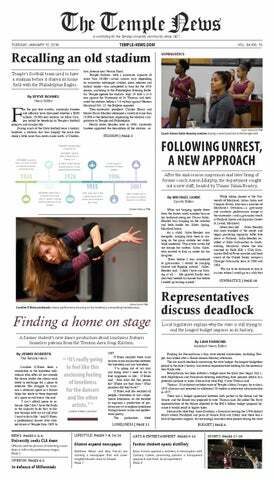 Anyone with inquiries about content in this newspaper can contact Editor-in-Chief Emily Rolen at editor@temple-news.com or 215.204.6737. Philadelphians should help welcome refugees to U.S. In order to uphold American ideals, we should aid refugees. sion that will largely depend on the winner of the next presidential election. Democratic presidential candidates Hillary Clinton and Martin O’Malley have both said the U.S. should accept 65,000 Syrian refugees in the coming years, while Republican presidential candidates are nowhere near as gracious. Republican presidential candidate Ted Cruz has suggested only those Syrian refugees who are Christian be allowed into the U.S., though the vast majority of Syrian refugees are Muslim. Republican presidential frontrunner Donald Trump has proposed barring Muslims from entering the U.S. altogether. For a country with a rich immigrant history, whose founding principles include religious freedom and tolerance, we have a moral obligation to accept all the refugees we can securely admit, regardless of their religious beliefs. ily gain sponsorship with a church, which quickened the process. Although Chogo’s application process took less time to complete than it usually does for most refugees she said the application was still rigorous. Chogo’s mother told her there was a lot of paperwork and traveling. At one point, her family had to travel to Benin, an African country thousands of miles to the northwest. “[My mother] said that there’s a lot of interviews to make sure that the right people are coming,” Chogo said. “And if [officials are] wary about your situation, they do ask around and are really strict about what your history was in the country.” In the case of Syrian refugees, Chogo said she doesn’t fear members of ISIS entering the U.S. in disguise, because she believes other refugees would alert U.S. I don’t think fears of ISIS are unfounded, “I While do believe Americans should have more faith in the vetting processes and security practices of our own government . Writing basics essential for all students Without a solid foundation, students will struggle in classes and in their careers. Intellectual Heritage or Analytical Reading & Writing, both of which are required for all students. “If we taught grammar and punctuation rules to first year writing students they’d be disinterested,” said Eli Goldblatt, the former director of the first year English department. Goldblatt believes it would be more effective to help students individually rather than taking up the bulk of a whole semester. More importantly, Stains said people often stop reading after the smallest mistakes. In regards to usage, punctuation and grammar mistakes. “All can bring your readers to a dead stop,” he said, stressing the importance of a strong grammar foundation in writing. from grade school—and finding it necessary. In defense of the hard-working Millennial We’ve been told we’re lazy and entitled—and we’re sick of it. and beer on tap,” in the workplace. “Another plus in millennials’ favor,” she said with obvious sarcasm: “They’re unafraid to publicly challenge their elders, even when it makes them look deeply foolish.” So here I am, Hingston, challenging you—willing to look foolish in the hopes that you may be able to open up your view of people “my age.” See, this article is nothing new. I’ve read several other articles dismissing up-and-comers in an industry for being inexperienced and unwilling to work from the ground up. We’ve been told time and time again that we’re all the same in who we are and how we act. We hear the discontent from Boomers like yourself, but I’m not sure what you’re proposing for us. Here’s what it’s like being on the other side. You mention Millennials wanting to be heard in the workplace, saying, “You know what’s awkward from an elder’s standpoint? Being expected to listen to and appreciate people who haven’t earned that right.” While I know some young people who exhibit traits Hingston describes—I can name too many people with Snapchat and Instagram addictions that border on unhealthy obsessions—I believe wanting to be an integral part of your work is a timeless trait that shouldn’t be relegated to only those at the top of the food chain. Visit temple-news.com/polls to take our online poll, or send your comments to letters@temple-news.com. Letters to the editor may regard any current issue but must include your full name, position and location. Students can give year and major. Submissions should be between 200600 words. for the fourth consecutive semester. These words are inherent bragging, yes, but I find myself saying them on repeat to adults who tell me over and over again how easy “us kids” have it. What we want out of life may differ from your generation, and I’m sure what my kids will yearn for will be vastly different from the “hardwood floors and sunlight” my generation supposedly wants. You are right, Hingston. We want work-life balance. We want to wear jeans to work and enjoy the time we spend there. We want to study things and have jobs that make us happy. But what that tells me about my generation, a concept that doesn’t seem to resonate with many of the nine-to-five adults who tell me I’ll never make any money as a journalist, is that we want to enjoy the life that we have—even if it doesn’t fit the conventions that were given to us by those who blindly followed. The good thing about all this noise about Millennials from those who say we’ll end the world, is that it is just that—noise. The Millennial population surpassed the Baby Boomers in 2015, the Pew Research Center reported, but they’ve made up the largest portion of Philadelphia for a while now. In December 2013, Philadelphia Magazine published the issue “The Millennial Revolution” to talk about the group’s growing impact on the city. The young people the article profiled valued the diversity, equality and lifestyle available to them here. While some call them “self-starters” and “entrepreneurs,” others, like Hingston, call them entitled. Whatever you want to call it, young people are changing the way people work in Philadelphia and across the world. And like it or not, we’re here to stay. FIFTY YEARS AGO TODAY... Jan. 12, 1966: The Temple News featured the last days of the Sullivan Library as students and faculty prepared for the opening of Paley Library. Today, we look forward to a new library to be completed in 2018. Construction crews will work on Norris Street until early February, a spokesman said. Fox Online MBA claims top U.S. News and World Report spot The Online BBA also jumped 25 spots in this year’s rankings. By STEVE BOHNEL News Editor The Fox School of Business’ Online MBA now stands alone as the best program of its kind in the country, according to U.S. News and World Report’s Online MBA rankings released Monday. Fox earned the top spot for its Online MBA program in this year’s rankings; last year, the program tied for first with the University of North Carolina and Indiana University. reform], it has the ability to collapse our [state’s] economy. COMMUNITY REPORTING Two Temple journalism alumni hope to keep the newspaper relevant in the Penn’s Garden area. Brewerytown, Fairmount, Francisville, Spring Garden, Strawberry Mansion, North Central, Ludlow and Poplar. “Despite being published hundreds of times online, it wasn’t until he saw it on paper on somebody else’s desk that he realized it was real,” Albasi said of their comic artist. A Kickstarter for The Spirit of Penn’s Garden, which releases its first issue Thursday, surpassed its goal of $15,000 last month. While some may consider the team’s expansion after about a year of work a surprise, Albasi said it’s always been a part of the plan. “When we started pitching this idea, it was never just one paper,” Albasi said. The Kickstarter’s success, the pace at which Riverwards has grown and the recent local media attention all seem to paint a different picture for the notion of print media ‘dying.’ Albasi said it “might not be as true as everyone said that it was.” The Spirit’s approach to ‘hyperlocal’ reporting is a big factor of what the newspaper stands for, Albasi said. With their motto, “Hyperlocal, Done Differently,” featured on the front of each rebranded paper and their redesigned website, it’s the community engagement and reporting that matter to the team. Matthew Albasi (left) and Thomas Howley work at the The Spirit News office at 1428 E. Susquehanna Ave. Jan. 6. Max Pulcini and Albasi are creating a second newspaper, The Spirit of Penn’s Garden. ‘What’s the Flu Crew? And what’s that all about?’ We kind of got them interested. cool tool to capture video in a new way that has never been possible for the average person. Brian Forrest, co-owner of Red Brick Craft Distillery, said he uses pickle jars at the distillery to measure and divide the distilled spirits. Forrest and Zachary Cohen opened the distillery in Kensington October 2015. They craft rum, whiskey and birch beer from local ingredients, catering to neighborhood patrons. A CLEAR-CUT T APPROACH Kensington’s Red Brick Craft Distillery opens the distilling process to patrons and stresses the use of locally-grown ingredients. naturally gravitated towards the things that we like and are passionate about. New stomping grounds for jazz Jim Hamilton’s new Germantown studio is at the forefront of a movement in jazz. By EMILY THOMAS The Temple News Philadelphia native and musician Jim Hamilton had no way of knowing the car repair shop down the street from his Germantown home would later become his stateof-the-art recording studio and performing arts space. The studio, Rittenhouse Soundworks Arts Complex, opened early this fall and has hosted a number of jazz performances since October that will continue into the new year. The small, intimate shows include performances by renown musicians like trombonist Jeff Bradshaw and percussionist David Friedman. After looking for a suitable studio space for nearly two years, the car repair shop went up for sale. Hamilton described the spacious, two-story building as his “dream space.” It became the new home for Rittenhouse Soundworks, which Hamilton wants to function not only as a recording studio and performance space, but also as an educational tool for students and the community. that we’ve ever created here in the United States. Brian Forrest watches over a barrel of brewing whiskey Jan. 3. Forrest must regulate sugar and temperature levels. Ariell Johnson looks at her poster of Storm, hanging in her store Amalgam Comics and Coffeehouse on Frankford Ave.
Ariell Johnson holds Saga, one of the comics in her recently-opened store, Amalgam Comics and Coffeehouse. Sociology professor Tom Waidzunas wrote “The Straight Line” about conversion therapy. Sandra Andino’s exhibit, “Afro-Latino in Philadelphia: Stories from El Barrio,” displayed photographs and audio. Caroline O’Brien produced “SOLOnely Together” a dance performance focusing on the loneliness surrounding homelessness, featuring dancers invited from Trenton Area Soup Kitchen and professionals. “If the weather’s bad and they’ve got to walk two miles in the pouring rain, it’s less likely they’ll be able to come,” she said. The annual Mummers Parade, a long-standing New Year’s Day tradition, featured the city’s citizens dressed in costume and dancing through Philadelphia’s streets. Participants belong to a specific troupe, or club, and are judged based on their troupe’s category. The annual categories for the Mummers Parade are the String Bands, the Fancy Brigade, the Wench Brigade, the Comic Division and the Fancy Division. After parading from South Philadelphia to City Hall and The Pennsylvania Convention Center, each troupe is judged in its individual category. The parade is broadcasted at City Hall and from there, troupes march to one of two locations. The Fancy Brigade marches to the Pennsylvania Convention Center and performs, which is televised for live audiences. All other troupes are routed down 2nd Street toward Washington Avenue past their clubhouses for a smaller audience. A few troupes were criticized for controversial costumes and signs this year, despite the addition of the Philadelphia Division, which aimed to bring more diversity to the parade. Brian Forrest reaches into a barrel of brewing whiskey at the distillery in Kensington. A percussionist and Rittenhouse Soundworks owner, Jim Hamilton, works in the studio in Rittenhouse. @muralarts tweeted Power’s mural at 20th and Tasker took the top spot in the program’s countdown of murals completed in 2015. The mural was part of a series in Ralph Brooks Park. @EWellingtonPHL, the fashion columnist at the Inquirer, tweeted she’ll be moderating a panel about creative design and business Jan. 28 at 6 p.m. during a Fashion Incubator event. TRENDING IN PHILLY The best of Philadelphia’s food, music, nightlife and arts. For breaking news and daily updates, follow The Temple News on Twitter and Instagram @TheTempleNews. @phillyinside tweeted the Little Lion opened Jan. 7. The restaurant’s title comes from Alexander Hamilton’s nickname. Chef Sean Ciccarone is planning a Southern-style comfort menu. @VisitPhilly tweeted a list of the best doughnuts in Philly, including the well-known Federal Donuts, Beiler’s Pennsylvania Dutch doughnuts, Undrgrnd’s concotions and Dottie’s Donuts’ vegan recipes. Neha Raman started her own company, Rungh Cosmetics, last year. The company allows customers to create new nail polish colors. Miles Christenson, a marketing major, stands next to his artwork at the KIND Institute in Point Breeze. The KIND Institute is aiming to change arts education in Philadelphia. display their work and “connect with each other,” Christenson said. “A typical day is not very typical,” he added. “We each have different roles such as teachers, curators, social media and marketing. We have meetings down at the paint gallery and talk about strategies.” “I love working with them [Maria Pandolfi and Ron Kustrup]—they are positive and determined to make a difference,” Christenson said. The Flu Crew, made up of six nursing seniors, hopes to reach a vaccine compliance rate of 90 percent with staff members in Temple University Hospital. The Spirit News staff works at its office at 1428 E. Susquehanna Ave. Jan. 6. Max Pulcini and Matthew Albasi bought The Spirit News and are working on a new newspaper, The Spirit of Penn’s Garden, to cover areas surrounding Temple. Kelly Derrig, 25, works at The Spirit News office Jan. 6.
you look left and right, and you just have to ask the right questions,’” he said. “The idea of hyperlocal then shaped to mean sort of finding those stories that are your next door neighbor’s.” As they now bring this approach to cover Temple’s neighborhood along with others, Albasi and O’Connor hope to have that same impact and effectiveness in interacting with the community and having a conversation about what they are doing. They also plan to get students and professors involved with Penn’s Garden in any way possible, so they can change people’s perceptions about print media and news in general. “For those who do want to be involved, who do want to be able to have some effect on their surroundings, I think that the news gives them the education that they need to discuss it and I think it gives them the platform,” Albasi said. Junior sprinter/jumper Bionca St. Fleur warms up during a recent practice at the Student Pavilion. Former basketball player Dionte Christmas signed with AEK Athens of Greece Jan. 7. Back in December, the guard signed with Hapoel Holon, an Israeli club, but only appeared in two games before he was released. It’s the most important “thing that we do. We have to defend and keep teams below 40 percent shooting. Senior forward/center Devontae Watson (center) cheers during the Owls’ 78-60 win against East Carolina at the Liacouras Center Saturday. Matthews: ‘We need to put in a lot more work’ The Owls finished inside the Top 10 in two of the team’s events last semester. I don’t think they realize the preparation needed to play Division-I-level golf. By GREG FRANK The Temple News Senior Brandon Matthews was unhappy with his team’s effort following the Owls’ fall season. At the end of the fall, Temple was ranked No. 255 out of 301 teams in Golfweek’s Division I men’s team collegiate rankings. Matthews pointed to the work ethic of his teammates as the reason. “I think we learned as a golf team we need to put in a lot more work,” Matthews said. “We need to become the [Top 200] team that we know we can be, but it’s going to come with a lot of work.” In the 2014-15 season, Matthews and the Owls finished in the Top 5 six times, including two first-place finishes. Temple has two Top 10 finishes, including one Top 5 finish, halfway through the 2015-16 season. To help his squad try to regain last season’s success, coach Brian Quinn has pointed to an individual who spent a total of 683 weeks as No. 1 of the Official World Golf Rankings. “Tiger Woods was the greatest player in the world for 15 years,” Quinn said. “And he was also the hardest worker.” Nine of the 12 golfers on the Owls’ roster are underclassmen, including six freshmen. Last season, the team had three seniors; two of them were in the team’s starting lineup. “I don’t think they realize the preparation needed to play Division-I-level golf,” Matthews said. (TOP): The gymnastics team members watched their teammate perform on the balance beam during a recent practice in their new facility at McGonigle Hall. (BOTTOM): A member of the gymnastics team practices on the balance beam. by totaling 18 points and 11 rebounds in a 92-62 win against Sacred Heart University. “I like playing the floor, going into the paint a little more,” Atkinson said. “Usually when the other player is taller than you, you are a lot quicker, so I just use my speed to take advantage of the other people.” With Atkinson spending more time in the paint against larger opponents, she said her body is feeling the pressure of her new position. Coach Tonya Cardoza instructs her team during a timeout in the Owls’ 66-46 win Saturday against Tulsa at McGonigle Hall. The Owls are averaging 72.1 points per game after coach Tonya Cardoza began using five guards in her starting lineup during the team’s last 10 games. Senior guard Erica Covile walks to the bench Saturday during the Owls’ 66-46 win against Tulsa. people. I just had to get off the court. Tanaya Atkinson stands in the Owls’ huddle during the team’s 6646 win against Tulsa at McGonigle Hall Saturday. Coach Fran Dunphy stands on the sideline during the second half of his team’s 78-60 win Saturday against East Carolina at the Liacouras Center. Film session sparks streak The men’s basketball team has won three of its first four conference games, including two wins against ranked opponents. Quenton DeCosey dribbles during the Owls’ 78-60 win against East Carolina Saturday.